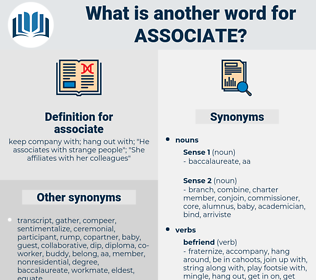 What is another word for associate? keep company with; hang out with; " He associates with strange people"; " She affiliates with her colleagues"
put oneself in another shoes. Aggregated, undergraduate, partner, involve, subordinate, Annexed. Participated, asserted, supported, joined, Offered, Teamed, granted, included, sent, handed, involved, Annexed, endorsed. participates, cooperates, supports, identifies, involves, refers. considered, combine, unite, equate, correlate, involve, endorsed, accede, Acceding, cooperate. associated, involved, prospective, sub-degree, quasi, engaging, involvement. collaborator, colleague, sub-degree, involvement, contributor, combination, sidekick. stranger, rival, antagonist, enemy, competitor, foe, opponent. dominant, Hinderer, instigator, principal, betrayer, opposer, chief, adversary, leader, commander. disassociate, disunite, separate, sever, disconnect, detach, part, divorce, avoid, divide, disperse, disjoin. Elizabeth had fully expected Estella to be pronounced entirely ungenteel, and no sort of person to associate with a Gordon. Well, you're the last woman in the world to associate with a parson! acid head, agitated, aesthete, assist, agitate, acidity, aged, agate, axe head, act out, acute, actuate, acadia, assiduity, ague weed, Asadha, acth, azido, aside, acuate, Agua Toad, august 1, aught, acetate, aikido, ask out, astute, agouti, august, agueweed, associated, Azo Dye, august 15, acid, aghast, acedia, as yet, augusta, accused, azide, ax head, asat, august 6, acheta, acquitted, 15 August 1945, assisted, acquit, accost, axseed, aguacate, acuity, ascot, actuated, acid dye, azote, asset, access code, azt, acaudate, accede, act, actaea, augite. workfellow, teammate, shipmate, friend, collaborator, affiliate, colleague, cooperator, ally, fellow worker, mate, adjunct, partner, pardner, co-worker, participant, player, confrere, fellow member, fellow, bedfellow, member. free-associate, remember, mean, correlate, identify, have in mind, interrelate, think of. equal, subsidiary, subordinate, compeer, match, foot soldier, peer, underling.